Billy Corgan was recently reunited with the Seventies-era Fender Stratocaster he used to record the Smashing Pumpkins’ 1991 debut album, Gish. The guitar, essential to the band’s early sound and decorated by Corgan with a custom psychedelic design, was stolen in June 1992 after a Pumpkins gig at St. Andrew’s Hall in Detroit. But according to a report on RollingStone.com, a woman named Beth James living in Flushing, Michigan, had the beloved instrument in her basement for a decade or so, after purchasing it at a local yard sale for $200. 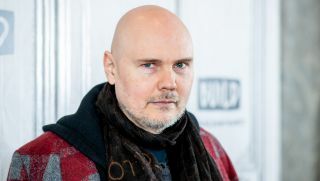 After a friend notified her that the instrument might in fact belong to the Smashing Pumpkins frontman, she began attempting to contact the band via various channels. A meeting was eventually organized by music finance company Sound Royalties, a company that has worked with the likes of Lil Wayne and Rich Robinson, and the guitar was returned to Corgan.